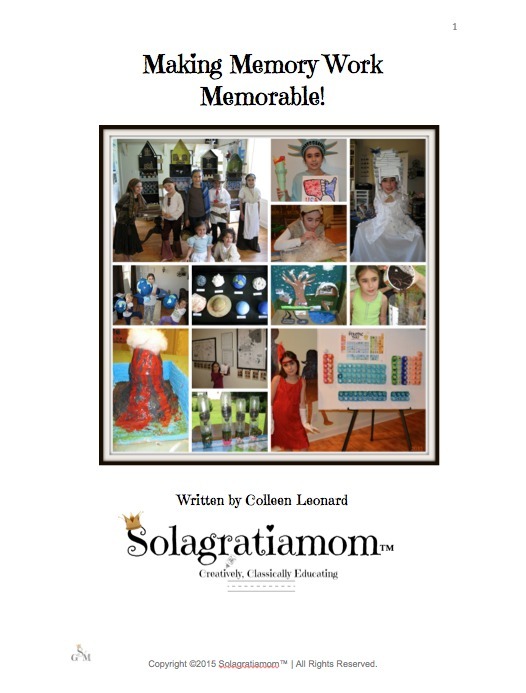 Solagratiamom: Week #16 - Four Types of Volcanoes! 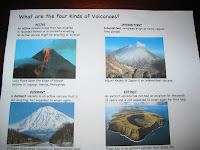 Week #16 - Four Types of Volcanoes! First I went to BJ's to get their boxes that hold the orange juice (they're tall on the sides but lower in the front). That way I was able to cut the sides down low enough to see the project but high enough to add their labels/photos, which I made with definitions for each type of volcano. Next I got empty toilet paper rolls and those became our vents for the volcano. 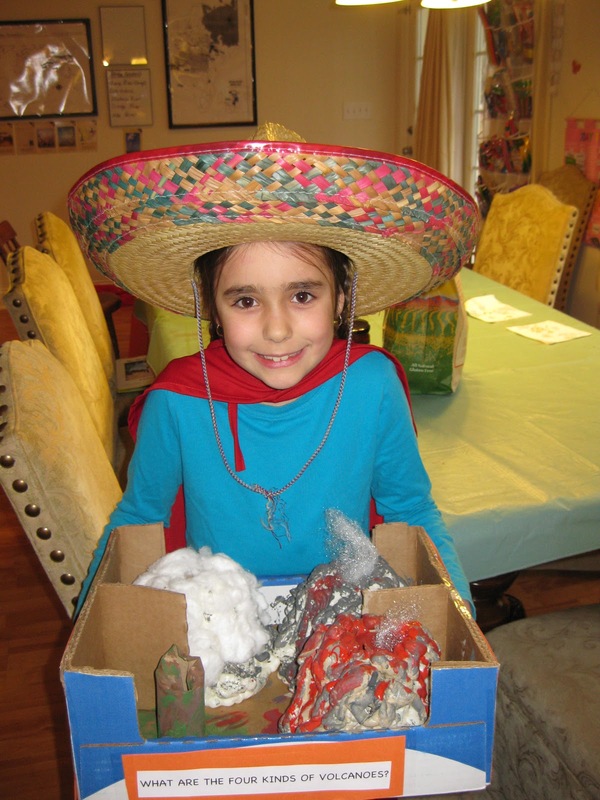 I taped them down -one for each kind of volcano they were learning - 4 in all. Next I built up the "frame" for the volcano. 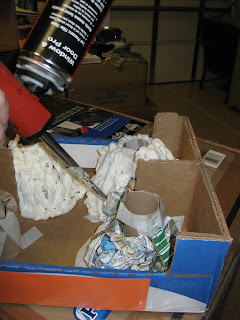 I used crumpled newspaper to put around the tp roll and then used strips of cardboard to make a sturdy frame. Then I had my handy Husband use foam sealer to go around the frame to give each volcano it's shape. There were two types of expanding foam he had on hand. The orange is a fire code type...I think that was what he said. We also did our lapbooks of course and our review games! Our Wednesday was WONDERFUL as they always are! So thankful for this group of women and children! We're having a blast working through our Memory Work together as a group each week! Of course no Mesoamerican theme would be complete without ending it on a Corn Chips and Salsa note! 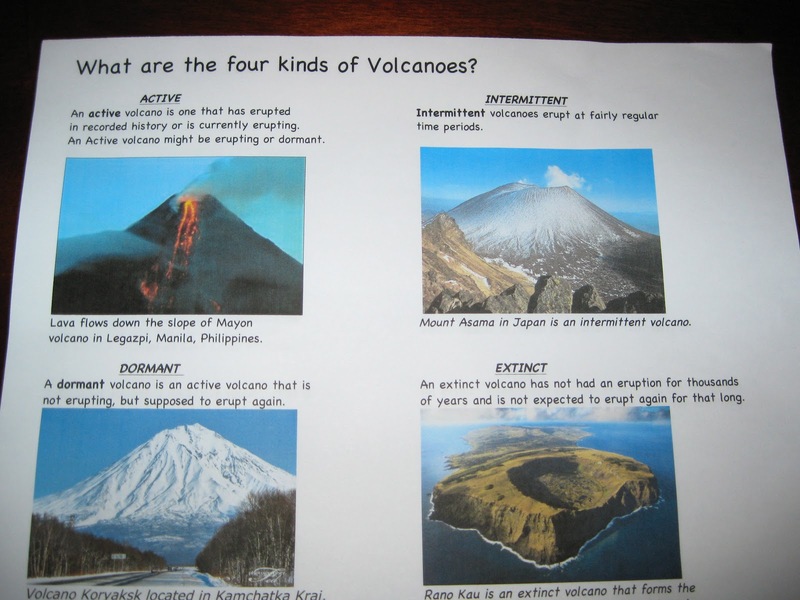 Do you have a link to the handout you had with the definitions/picture/images of the 4 different kinds of volcanoes? My kids LOVED this project! Thank you Mr. DAVE!!!!!!!!!!! I was wonering so do you meet with some of your cc group outside of cc day as well as having cc day? for some of these cool related projects?